A small section of the 1935 topographic map. A friend of mine recently gave me a large collection of vintage maps of Mount Shasta and Siskiyou County. While the terrain has not changed, the names and cartographic techniques certainly have. Of course, it is nearly a moral imperative that I put up some articles on these maps and examine how things have changed since the 1860’s (rough date of the first map). It will be a fascinating journey through how much the names, perceptions, and human imprint on the land has changed. However, this is not the post I begin that series. Instead, rummaging through all the vintage maps has gotten me thinking of some of the posts I have written about historic objects I have come across. I am captivated by these artifacts and think they provide some context for the time spent out of doors. Indeed, I believe that hiking in the wilds is as close as we can get to time travel since we can immerse ourselves in a place that is unchanged since people hundred or even a thousand years ago occupied the same place. 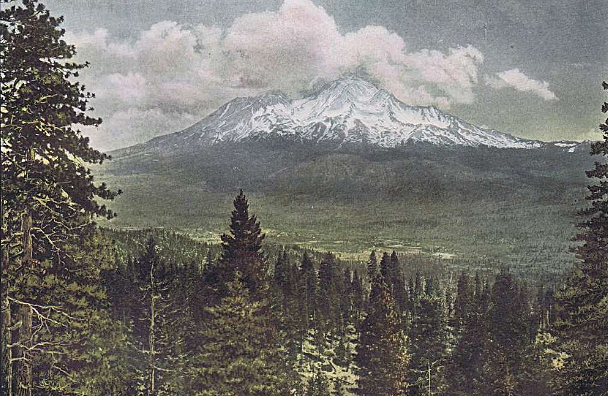 Most of the posts I have written on Mount Shasta history have focused on old art and images of the mountain. These can be captivating views into how older generations perceived the mountain and the surrounding landscape. It is my hope that by collecting these posts in one place that you will find them interesting and consider those who have gone before us when exploring the beauty of the Mount Shasta area. I’d encourage you to follow the links to get more detail on each image and piece of art. 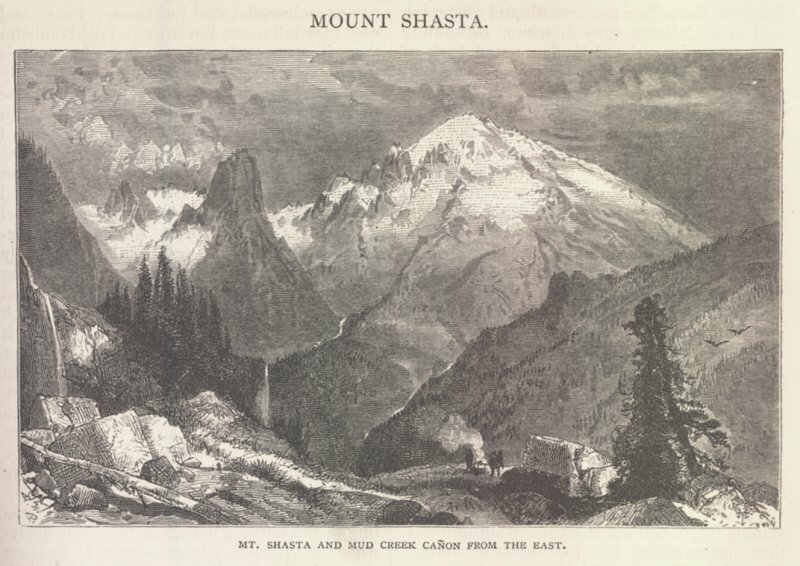 In this post I examined a 19th century engraving of Mount Shasta by Thomas Moran. It depicts a spectacular view of Mount Shasta from Mud Creek Canyon. 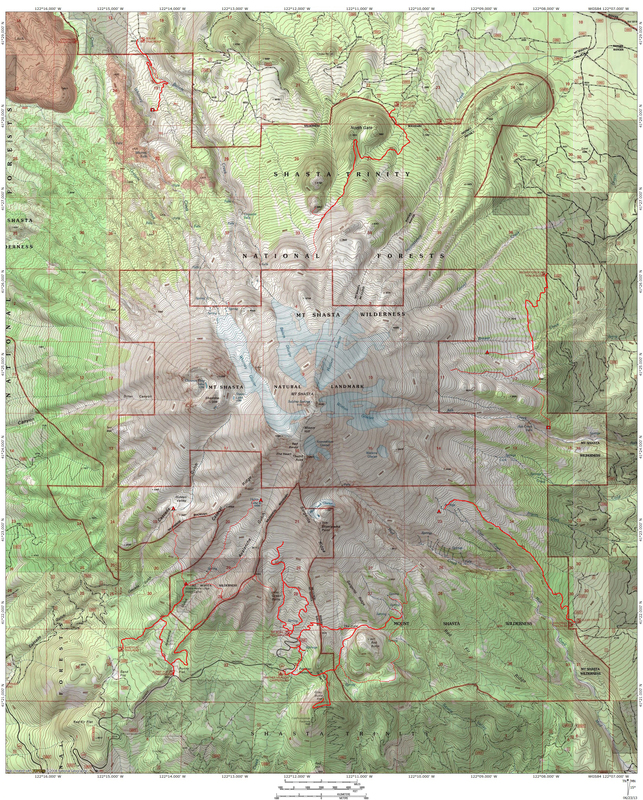 Though some of the features are very exaggerated in their proportions, it is still a fairly accurate portrayal of Mount Shasta and the canyon. It even features Mud Creek Falls, one of my personal favorite features on the mountain. In the post I included a breakdown of what each landmark is and how is corresponds to what can be seen from the Clear Creek Trail. The two posts (Part 1 and Part 2) that were done on this painting were the 2nd and 3rd posts I wrote when I first started Hike Mt Shasta. My mom found this painting in a thrift store down in Santa Rosa. 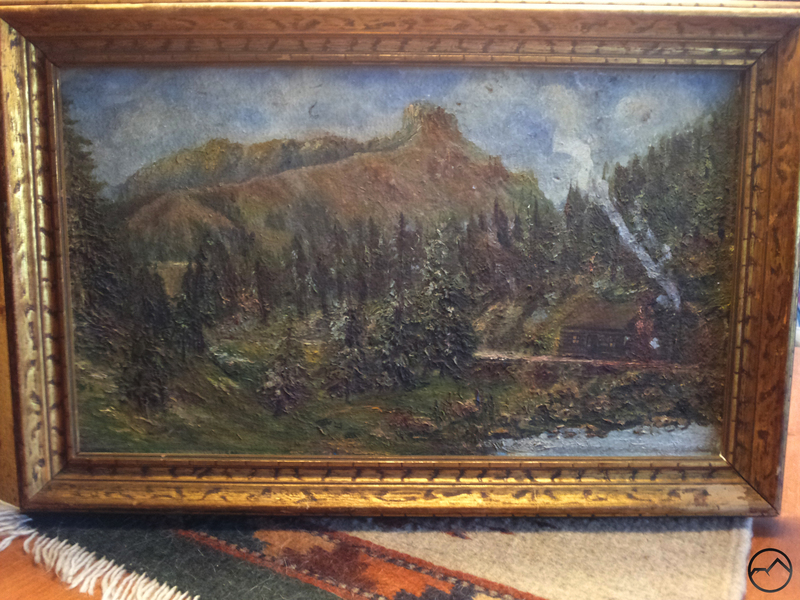 The back has a label by a professional artist and this identified it as being Mount Shasta. Though it obviously bears no resemblance to the mountain at first glance, I still recognized the perspective depicted in the painting. Naturally I had to find out more about the painting and this necessitated a trip to the College of the Siskiyous library and working with some local Mount Shasta art aficionados to figure out how old the painting actually is. In a more recent article, I linked to a collection of early 20th century photos produced as promotional material for the Southern Pacific Railroad. The images were colorized, which almost made them look like drawings or paintings. Nonetheless, they were an interesting look back at what the railroad pushed in terms of tourism for the area over 100 years ago. 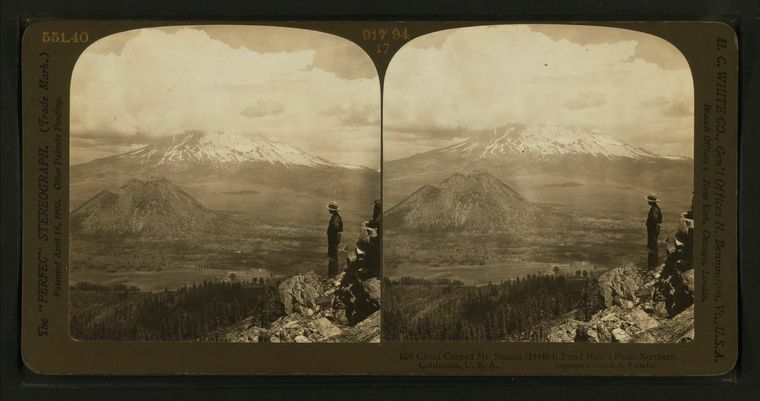 The most recent article I have written on this subject was on an incredible collection of stereographic images of the Mount Shasta area. This was a very diverse group of pictures that preserved various perspectives on the mountain, long gone historic sites, and the towns around the mountain. This collection also finally helped solve the mystery of where some unusual pictures of Black Butte had been taken (the subject of a forthcoming post). The last post I wanted to put up does not quite fit in with the rest but is worth mentioning. It concerns a somewhat forgotten vista point and monument on Mount Shasta. Though it is prominently identified on the Everitt Memorial Highway, the vista and monument don’t see too much traffic anymore since the forest has encroached on the vista and the view is no longer what it once was. 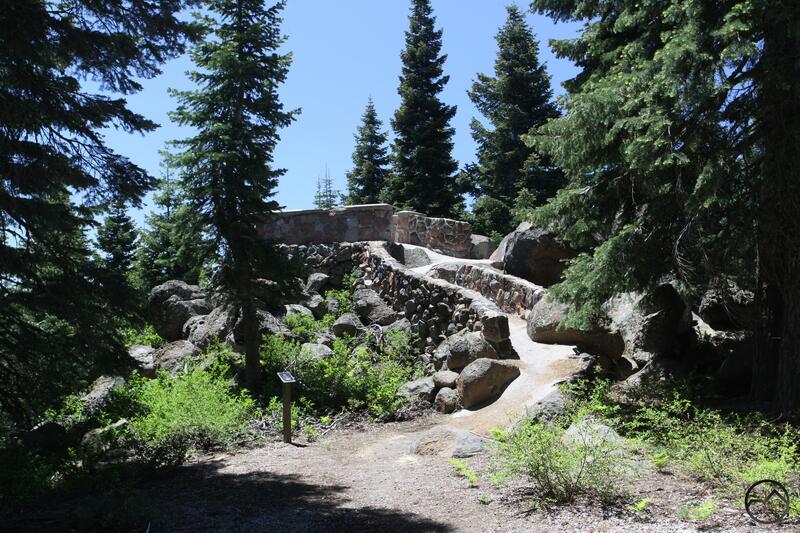 Built to memorialize John Everitt, the Shasta National Forest supervisor who died near there fighting a fire in 1935.